A favorite with chemists and lab technicians everywhere. Totally enclosed, 1/40 hp, permanent magnet motor with two output shafts for maximum speeds of 4,000 and 333 rpm. The armature shaft provides high speeds for mixing light materials, while the geared shaft generates 3.6 lb. - in. (4.2 kg-cm) of torque at slower speeds for stirring more viscous mixtures. Continuously variable speed control. Lab stand, MX-A130150, is recommended to mount the GT31 but not included with the System. Combines today's permanent-magnet motor technology with solid state electronics. Totally enclosed, 1/17 hp, cool, and quiet-running motors with direct-drive and geared options. Models available with speeds up to 2,500 rpm and torques up to 12 lb. - in. (13.8 kg-cm). Continuously variable speed control. Lab stand, MX-A130150, is recommended to mount the GT24 but not included with the System. A powerful stirring outfit. Totally enclosed, 1/8 hp, cool, quiet-running, permanent magnet motor in direct and gear-drive models with torques from 3.1 lbs.- in. (3.57 kg-cm) to 96 lb. - in. (111 kg-cm). 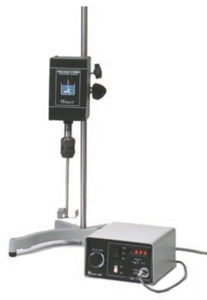 Provides a stirrer with more power than the 6T60 and a selection of speed ranges up to 2,500 rpm. Continuously variable speed control. 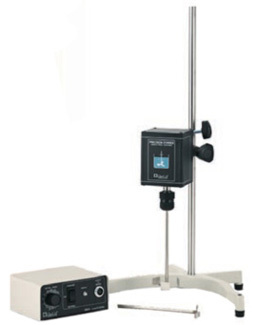 Lab stand, MX-A130150, is recommended to mount the ST-20 but not included with the System. Viscosity measurement is easier thanks to a controller with a digital readout switchable between speed and torque. Data on shear stress, shear rate, velocity gradients, and viscosity is accumulated easily with external DC voltage signals for speed and torque (for strip or X-Y recorders) available through an output port on the rear of the control. Operator convenience and safety is increased with cord connections between drive motors and controls to allow control placement away from hostile environments. Totally enclosed, 1/17 hp, permanent-magnet DC motor. Direct-drive model provides 20 to 2,500 rpm and 1.5 lb-in. 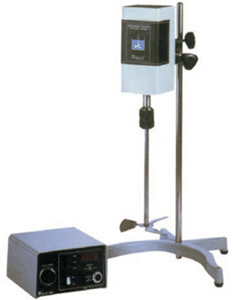 torque (1.73 kg-cm). The HST10 is available in direct-drive and geared models in 6:1 and 12:1 ratios for max. speeds/torques of 417 rpm/5.4 lb-in. (6.2 kg-cm) and 208 rpm/12.0 lb. - in. (13.8 kg-cm) respectively. 1/8 hp, totally enclosed, permanent-magnet DC motor. Direct-drive model provides speeds up to 2,500 rpm and 3.6 lb. - in. (3.6 kg-cm) of torque. Geared model HST20 gives 2 to 266 rpm and torque of 21 lb. - in. 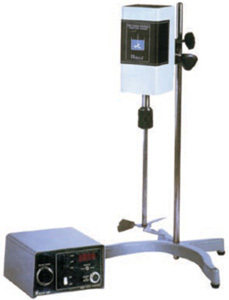 (24.2 kg-cm).Other models provide torques up to 96 lb. - in. (111 kg-cm). 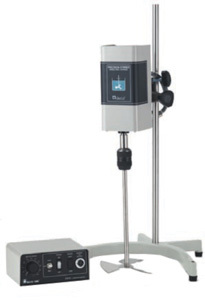 The HST20 offers the outputs and speed maintaining capability of the HST10 series along with increased stirring power for more difficult laboratory applications. 1/4 hp, totally enclosed, permanent-magnet DC motor. Direct drive model provides speeds up to 2,500 rpm and 6.3 lb. - in. (7.3 kg-cm) of torque for more viscous applications. A variety of gearing options allow for even higher torque output (up to 90 lb. - in.) without putting undue stress on the motor. 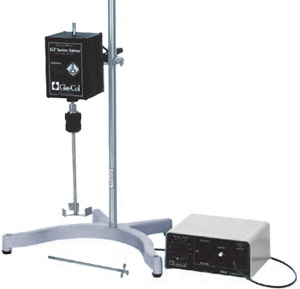 This new clamp provides secure, reliable, and easy support of lab equipment. The 90-Degree Clamp is designed to be easier and more user-friendly than most common laboratory clamps. Equipment adjustments that used to take three hands, pliers, and lots of patience can now be done easily in a few seconds. The triangular knobs fit comfortably in the hand and are large enough so that hand tightening applies sufficient pressure to hold rods securely. 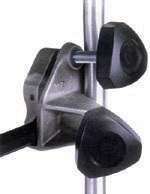 Both knobs are located on the same side of the clamp so that switching hands or awkward hand positions during equipment adjustments are eliminated. The Heavy-Duty Clamp may be used on conventional round support rods from 1/2" to 3/4" diameter. 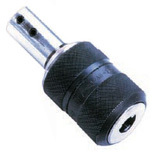 It is especially designed for use with the new antirotational octagonal rods.